Home Match Our Spurs team to face West Brom – What’s yours? 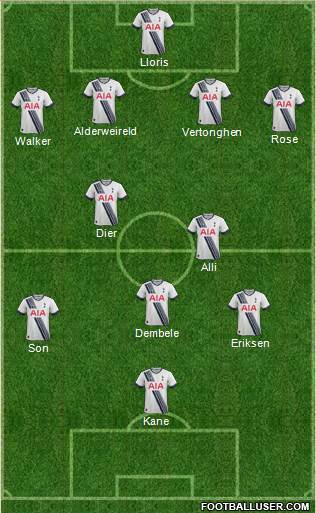 Our Spurs team to face West Brom – What’s yours? With many of the Premier League rivals looking like they should pick up a win this weekend, it is vital that Spurs emerge victorious from their game with West Brom. Ryan Mason was injured in the 0-0 draw with Chelsea, while Dele Alli looks set to return after suspension. Erik Lamela is another option for Mauricio Pochettino, but we’d go with the side that defeated West Ham 4-1 two weeks ago. Here’s our Tottenham side to face West Brom, what’s yours? the only possible change would be lamela for sonny. lamela has been defending well, and they will try hit us on the counter. However, its neither here nor there, good to have a settled line up, sonny or lamela are great options for the moment! 2-0 spurs. Same line up for me that beat the hamster 1.3 spurs? I would put son over eriksen.. i knqow eriksen is good at defending but idk.. he’s not really that good on the flank.